Once upon a time, a little fish lived with its family in a pond inside a dense forest. There were so many other fishes also in that pond. The father of the little fish was the king of all the fishes in that pond. One day, a big dinosaur who lived in that jungle came to that pond and drank almost half of the water of that pond. All the fishes were worried that the dinosaur would come back the next day and drink the whole pond. They went to the king fish for help. Even the king fish didn't know how to solve this problem. It said that nothing can be done to stop a big dinosaur. Just then the little fish said, "Oh father, I have an idea. I will defeat the dinosaur tomorrow"
The next day, when the dinosaur came again to drink water, the little fish came above the water, went to the dinosaur and said, "Dear Dino friend, please don't drink water from this pond"
The dinosaur laughed and said, "ha.. ha.. you little fish, you cannot put order to me. I will drink the whole pond today". But the little fish didn't give up. He kept on requesting the dinosaur to go away to some other pond. Finally, the dinosaur said, "OK friend... let us have a race from here to that end of this pond. If I win, then I will drink the water. If you win, I will obey your order". The fish agreed for the challenge. The race began, the little fish swam as fast as he could. But the dinosaur was so heavy, so it couldn't run. 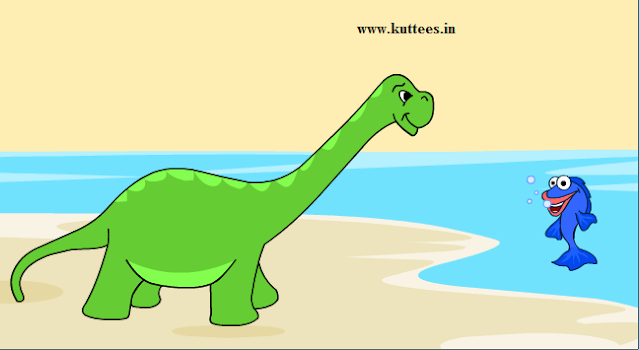 The dinosaur lost the race and went away searching for another pond. MORAL: There will be a solution for every problem. One should never give up.